Monoterpenes present a large and versatile group of unsaturated hydrocarbons of plant origin with widespread use in the fragrance as well as food industry. The anaerobic β-myrcene degradation pathway in Castellaniella defragrans strain 65Phen differs from well known aerobic, monooxygenase-containing pathways. The initial enzyme linalool dehydratase-isomerase ldi/LDI catalyzes the hydration of β-myrcene to (S)-(+)-linalool and its isomerization to geraniol. A high-affinity geraniol dehydrogenase geoA/GeDH and a geranial dehydrogenase geoB/GaDH contribute to the formation of geranic acid. A genetic system was for the first time applied for the betaproteobacterium to prove in vivo the relevance of the linalool dehydratase-isomerase and the geraniol dehydrogenase. In-frame deletion cassettes were introduced by conjugation and two homologous recombination events. Polar effects were absent in the in-frame deletion mutants C. defragrans Δldi and C. defragrans ΔgeoA. The physiological characterization of the strains demonstrated a requirement of the linalool dehydratase-isomerase for growth on acyclic monoterpenes, but not on cyclic monoterpenes. The deletion of geoA resulted in a phenotype with hampered growth rate on monoterpenes as sole carbon and energy source as well as reduced biomass yields. Enzyme assays revealed the presence of a second geraniol dehydrogenase. The deletion mutants were in trans complemented with the broad-host range expression vector pBBR1MCS-4ldi and pBBR1MCS-2geoA, restoring in both cases the wild type phenotype. In-frame deletion mutants of genes in the anaerobic β-myrcene degradation revealed novel insights in the in vivo function. The deletion of a high-affinity geraniol dehydrogenase hampered, but did not preclude growth on monoterpenes. A second geraniol dehydrogenase activity was present that contributes to the β-myrcene degradation pathway. Growth on cyclic monoterpenes independent of the initial enzyme LDI suggests the presence of a second enzyme system activating unsaturated hydrocarbons. Monoterpenes represent a prominent group of volatile organic compounds (VOC), with an estimated mean global emission of 117 Tg C yr-1 into the atmosphere and a fast photochemical turnover. Especially coniferous plants are considered to be main producers of monoterpenes, e.g. for thermotolerance or for communication between plants or the interaction between plants and insects[3–5]. Monoterpenes also enter the soil by the rhizosphere or by rotten leafs, where they inhibit growth of microorganisms as well as of seedlings[7–9], but also stimulate the bacterial activity detectable in higher biomass and CO2-production[5, 10, 11]. By definition, monoterpenes possess a carbon skeleton based on two C5 units originating from isopentenyl pyrophosphate (IPP), which is synthesized via the mevalonate (in eukaryotes) or the mevalonate-independent pathway (in prokaryotes and plant plastids)[12–14]. Mainly, plant monoterpenes are produced via the latter pathway, but the metabolic cross linkage between both has been reported in several species[15, 16]. Monoterpenes are together with sesquiterpenes the major constituents of essential oils. Due to their status – they are generally recognized as safe (GRAS) - and their odorous properties, these substances are widespread in the food, cosmetics, flavour and fragrance industry. Monoterpenes are utilized as energy and carbon source by several aerobic microorganisms, a fact known since the 1960s[19–21]. Most reports dealt with Pseudomonas species, e.g. [22–28], but also Bacillus stearothermophilus, Rhodococcus erythropolis, and Enterobacter cowanii metabolize these hydrocarbons. The microbial degradation of α-pinene and limonene, one of the most widespread monoterpenes in nature, involve complex and multiple pathways that comprise in large part oxidation reactions[30, 32–34]. In addition these studies revealed the importance of oxygenases, which catalyze hydroxylation reactions with molecular oxygen as co-substrate[35–38]. Under anaerobic conditions, the biochemistry for the activation of these natural abundant alkenes seems to follow a totally different mechanism. The first evidence for the anaerobic degradation of monoterpenes were seven nitrate-reducing enrichment cultures with monoterpenes as sole carbon source. Isolation led to the description of four Alcaligenes defragrans strains, including strain 65Phen isolated with α-phellandrene. A taxonomic study transferred these strains in the novel genus Castellaniella within the Alcaligenaceae, as C. defragrans. The betaproteobacterium is capable of degrading a broad substrate range of a-, mono-, and bicyclic monoterpenes (Figure 1). Initial metabolite studies on the anaerobic monoterpene degradation pathway in C. defragrans elucidated the demand for a sp2-hybridized C1-atom as structural prerequisite for monoterpenes utilization as well as the formation of geranic acid as intermediate, which is likely degraded on a modified β-oxidation pathway[44, 45]. These findings proposed the degradation of β-myrcene via hydration to linalool, followed by isomerisation to geraniol, and then two oxidations to geranial and to geranic acid. The genes and proteins involved this pathway were recently identified[46, 47] (Figure 2). The bifunctional linalool dehydratase-isomerase ldi/LDI catalyzes the first two steps, the highly enantiospecific hydration of β-myrcene to (S)-(+)-linalool and its isomerisation to geraniol[46, 48]. Subsequently, two dehydrogenases oxidize the allylalcohol geraniol and geranial. The geraniol dehydrogenase geoA/GeDH (E. C. 1.1.1.183) is a member of the medium-chain dehydrogenase/reductase superfamily with high affinity for its substrate geraniol. In vitro studies confirmed the activity of a geranial dehydrogenase geoB/GaDH. Both dehydrogenases were expressed in cells growing with monoterpenes. Monoterpene substrate range of C. defragrans. Anaerobic degradation pathway of β-myrcene by C. defragrans . Anaerobic β-myrcene degradation in C. defragrans 65Phen. I, β-myrcene (7-methyl-3-methylen-1,6-octadien); II, (S)-(+)-linalool; III, geraniol ((2E)-3,7-dimethyl-2,6-octadien-1-ol); IV, geranial ((2E)-3,7-dimethyl-2,6-octadien-1-al); V, geranic acid ((2E)-3,7-dimethyl-2,6-octadienoic acid). LDI, linalool dehydratase-isomerase; GeDH, geraniol dehydrogenase; GaDH, geranial dehydrogenase. So far, the evidence for the anaerobic β-myrcene degradation pathway was rather biochemically based on metabolite and enzyme studies. To prove the physiological role in vivo, we created deletion mutants of C. defragrans missing the gene ldi and geoA, respectively. The previous findings, i.e. the geranic acid formation and the induced dehydrogenase activities, were observed in both acyclic and monocyclic monoterpenes grown cells and suggested the existence of a common degradation pathway. To clarify whether there is one defined metabolic route or multiple pathways present for the anaerobic degradation of monoterpenes in C. defragrans, we deleted the initial, β-myrcene-activating enzyme, the LDI. The deletion of the GeDH was of interest due to the frequent presence of multiple alcohol dehydrogenases in genomes, often with a broad substrate range. Growth of C. defragrans as single colony under denitrifying conditions was achieved on acetate in a defined, solidified medium. A spontaneous mutant strain resistant to rifampicin (150 μg/ml) was obtained showing the phenotype of the wildtype with respect to growth on monoterpenes (Additional file1: Table S1). Conjugation was established with the broad host range plasmid pBBR1MCS-2, proceeding with a frequency of 1.8 × 10-4 transconjugants cell/ donor cells in 8 h (Additional file1: Table S2). The plasmid was maintained in C. defragrans. For genomic deletion mutants, we constructed pK19mobsacBΔldi and pK19mobsacBΔgeoA that carried the start and stop codon of the ldi (ORF26) or geoA (ORF31) separated by a specific restriction site and the upstream and downstream located regions (Additional file1: Figure S1). The sequence information was obtained from a 50 kb contig (Acc. no. FR669447.2) with the following annotation for ORFs adjacent to ldi or geoA: ORF27 as a thioesterase, ORF29 as a putative subunit of cytochrome c oxidase, ORF30 as a secretory protein and ORF32 as a long-chain-fatty-acid CoA ligase, while for ORF25 only hypothetical proteins were found in database queries (Additional file 1: Figure S2). Conjugation and homologous recombination yielded genomic in-frame deletions, with a second recombination frequency of 0.5% and 1.25% for the deletion of ldi and of geoA, respectively. Analysis by PCR revealed in the deletion mutants the expected, shortened amplicons with primer pairs spanning the deleted gene in comparison with the wild type (Additional file1: Figure S3). Polar effects due to the deletion of ldi or geoA were not detected in mRNA analyses (Additional file1: Figure S4). The genes ldi or geoA and their native ribosomal binding site were cloned in the MCS of pBBR1MCS plasmids. Conjugation into C. defragrans deletion mutants yielded ampicillin-resistant transconjugants named C. defragrans Δldi comp and kanamycin-resistant transconjugants named C. defragrans ΔgeoA comp. Under standard culturing conditions for anaerobic, denitrifying growth with 10 mM nitrate and 4 mM cyclic α-phellandrene or limonene in 2,2,4,6,6,8,8-heptamethylnonane (HMN), C. defragrans strains 65Phen, Δldi, and Δldi comp grew to final OD ranging from 0.25 to 0.35 (Figure 3A, B). C. defragrans strains 65Phen metabolized the acyclic β-myrcene, but C. defragrans Δldi lacking the gene for the ldi failed to grow with this substrate (Figure 3C). The in trans complementation Δldi comp restored the wild type phenotype. These data showed that the LDI is essential for the metabolism of β-myrcene, but not for the cyclic monoterpenes α-phellandrene and limonene. Time courses of anaerobic denitrifying growth of C . defragrans mutant strains. Time courses of anaerobic, denitrifying growth of C. defragrans strains 65Phen (●), Δldi (□), Δldi comp (■), Δgeo A (▵) and Δgeo A comp (▴) on different carbon sources, namely (A) 4 mM α-phellandrene, (B) 4 mM limonene, and (C) 4 mM β-myrcene. Negative controls without inoculum or without substrate did not show an increase in turbidity (data not shown). In previous studies, β-myrcene as well as α-phellandrene supported the formation of geranic acid in cell suspension experiments. The geranic acid pool was 10fold larger in β-myrcene experiments than with the cyclic monoterpenes α-pinene, α-phellandrene, and limonene. We assayed the geranic acid pools in C. defragrans mutant strains under nitrate-limited conditions in liquid cultures on 6 mM monoterpene in HMN (Table 1). This metabolite was only detectable in myrcene-grown C. defragrans cultures with the ldi either present in the genome or in trans, in concentrations of 8.85 μM and 6.61 μM, respectively. In α-phellandrene grown cultures, geranic acid was detectable in media of these C. defragrans strains in concentrations of 0.24 μM and 0.33 μM. Geranic acid formation was not detectable in cultures of the mutant lacking the gene ldi. The RP-HPLC detection limit was 6.4 nM, thus geranic acid formation in C. defragrans Δldi was below a thousandth of that in the wild type. Growth on α-phellandrene clearly does not involve the formation of geranic acid suggesting the presence of another monoterpene degrading pathway that circumvents the activation of the substrate by LDI as well as geranic acid formation. C. defragrans cultures were grown in 150 mL with 6 mM α-phellandrene or β-myrcene and 10 mM nitrate at 30°C and 130 rpm. Inoculum size was 1% (v/v). Duplicate determination. Detection limit for geranic acid was 6.4 nM. n.d. = not detectable. Under aerobic conditions microbial biotransformation of (−)-limonene and β-myrcene revealed the formation of enantiopure (−)-perillyl alcohol, perillyl acid and myrcenic acid[30, 50–52]. Anaerobic hydroxylations catalyzed by molybdenum enzymes have been recently reported, e.g. the hydroxylation of ethylbenzene to (S)-phenylethanol in Aromatoleum aromaticum and of cholesterol to cholest-1,4-diene-3-one in Sterolibacterium denitrificans. Whether the degradation of cyclic monoterpenes proceeds via a homologue pathway is subjected in ongoing research. To our knowledge, this is the first report on the existence of different activation mechanisms for cyclic and acyclic monoterpenes in one bacterial strain. The deletion of geoA resulted in an increased generation time and reduced biomass yields, e.g. on α-phellandrene, limonene and β-myrcene (Figure 3A-C, Table 2). Nitrate was completely consumed, but the generation time was always prolonged, e.g. 3.5-fold for α-phellandrene. The biomass formed as determined by protein analyses was decreased by 32% to 48% in the deletion mutant (Table 2). Most likely, geraniol was oxidized at slower rate in the deletion mutant. This seems to have an inhibitory effect on the growth due to the known geraniol in vivo toxicity of above 5 μM in the aqueous phase. 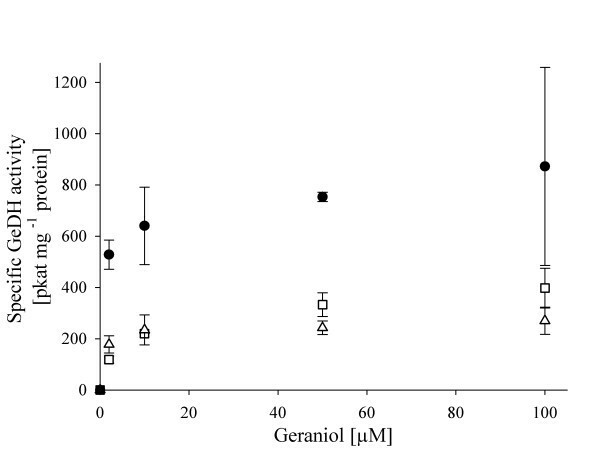 The intracellular geraniol concentrations were below the detection threshold of gas chromatographical analysis, but we observed physiological evidence for increased geraniol pools. In the cultivation system with HMN, 4 mM geraniol stopped monoterpene utilization completely. In the wild type, addition of 16 mM acetate supported growth in the presence of 4 mM geraniol and 20 mM nitrate to an OD660 of 0.15 (± 0.002; n = 2). The deletion mutant C. defragans ΔgeoA also grew after acetate addition, but reached only an OD660 of 0.061 (± 0.01; n = 2), although both strains consumed the same nitrate amount. In conclusion, C. defragans ΔgeoA reacts more sensitive towards geraniol than the wild type. C. defragrans strains 65Phen (wild type), Δgeo A and Δgeo A comp were grown under standard conditions at 28°C for 280 h (α-phellandrene, limonene) or for 304 h (β-myrcene) with 4 mM monoterpene (in HMN) and 10 mM nitrate. As negative control served a culture without inoculum. The growth phenotype of the wild type was recovered in the mutant strain by complementation with the geoA gene located on a broad-host range plasmid. The in trans complemented mutant C. defragrans ΔgeoA comp revealed physiological characteristics similar to C. defragrans 65Phen: growth rate and yield, monoterpene consumption and nitrate reduction were almost identical suggesting that the wild type phenotype was restored by GeDH constitutively expressed from the plasmid pBBR1MCS-2geoA (Table 2, Figure 3). The absence of GeDH was expected to reduce the rate of geranic acid formation. In this study, geranic acid was detected in cultures grown on 6 mM monoterpene in the presence of HMN and 10 mM nitrate (Table 1). Cultures were sampled after nitrate depletion. Geranic acid concentrations of acidified and lysed cultures were 9 ± 1 μM in the medium of the wild type and 12 ± 1 μM in the medium of the complemented mutant, but only 5 ± 2 μM in the medium of C. defragrans ΔgeoA, thus revealing a limited capacity to form geranic acid in the absence of GeDH. The ΔgeoA phenotype has still the capacity to degrade monoterpenes, an indication for the presence of another alcohol dehydrogenase that catalyzes the geraniol oxidation. Thus, we tested the GeDH activity spectrophotometrically in cell-free, cytosolic extracts of C. defragrans strains 65Phen, ΔgeoA and ΔgeoA comp. Under standard conditions, with 0.8 mM geraniol as substrate and identical protein concentrations in the assay, the geraniol oxidation rates were 5.8 nkat mg-1 protein for C. defragrans 65Phen and 1.05 nkat mg-1 protein for C. defragrans ΔgeoA. Complementation restored the activity to 9.4 nkat mg-1 protein in C. defragrans ΔgeoA comp. The in vivo concentration of geraniol inside the cell is expected to be in the micromolar range. The GeDH activity in the extracts of C. defragrans ΔgeoA catalyzed the reaction with a high affinity, the apparent concentration for half-maximal rate was below 10 μM geraniol (Figure 4). This indicated an activity of the second alcohol dehydrogenase at physiological conditions. Initial specific GeDH activity of C. defragrans strains 65Phen, Δ geoA and Δ geoA comp. The initial specific GeDH activity was measured in triplicates with cytosolic, cell-free extracts of C. defragrans strains 65Phen (□), ΔgeoA (Δ) and ΔgeoA comp (●). Geraniol concentrations tested were 0, 2, 10, 50, 100 μM. In summary, the presented data argue for a reduced geraniol flux to geranic acid in the metabolism of the deletion mutant. We suggest that a geraniol accumulation or increased pools of metabolites derived from geraniol on other pathways cause a reduced growth rate as indicated by prolonged generation time, decreased biomass production, and reduced geranic acid formation. The accumulation of a toxic intermediate in monoterpene catabolism causing reduced growth rate has also been seen for deletion mutants of P. putida M1 in ß-myrcene degradation[24, 55]. Accumulation of geraniol is known to be toxic for cells: due to its hydrophobic properties it can integrate into bacterial membranes causing disintegrations followed by failure of the proton motive force[56, 57]. The presence of several ADHs in a genome is not unusual. In microorganisms, alcohol dehydrogenases possess a wide variety of substrate specificities and are involved in different physiological functions. For various ADHs deficient mutants, retarded growth on the prevailing substrate and reduced ADH activity was observed[59–61]. Also in plants the existence of additional ADHs capable of oxidizing geraniol was suggested. We developed a genetic system for Castellaniella defragrans and constructed in-frame deletion mutants that allows for insights into the physiology of the anaerobic degradation of monoterpenes. 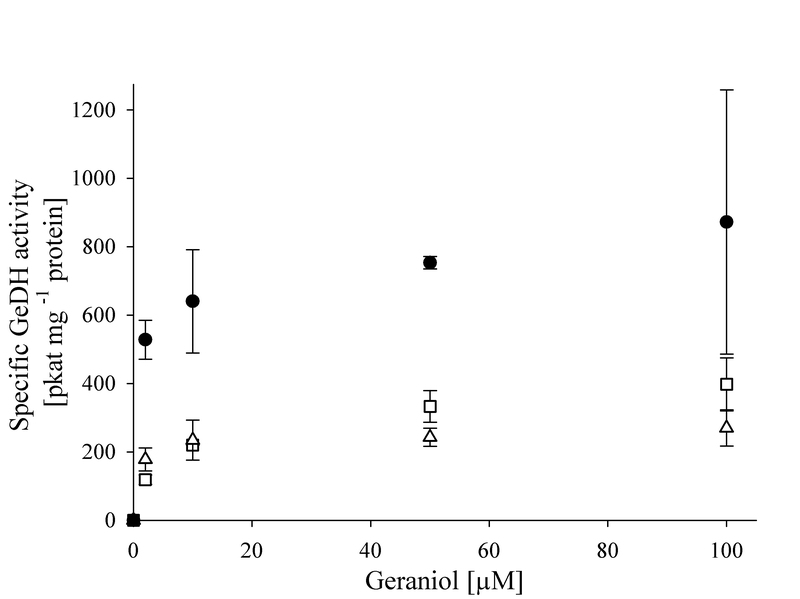 C. defragrans ΔgeoA lacking the gene for a geraniol dehydrogenase was physiologically analysed. The geoA deficient strain exhibited reduced growth on monoterpenes and slower geraniol oxidation rates in soluble extracts, in comparison to the wild type. The original phenotype was restored in trans with an episomal geoA in the C. defragrans ΔgeoA comp. One explanation for the reduced growth is a higher steady-state level of geraniol in the cell causing toxic effects. These observations together with reduced geranic acid formation demonstrate clearly a participation of GeDH in the anaerobic degradation of β-myrcene. However, the geoA deletion is not mortal. A second GeDH activity is present in soluble extracts. This suggests a need for both GeDHs to balance the geraniol formation by oxidation during fast growth of the wild type. The physiological characterization regarding growth with acyclic and cyclic monoterpenes exhibited an unexpected effect of the ldi deletion that caused a phenotype dependent on the substrate structure in C. defragrans Δldi: the cyclic monoterpenes α-phellandrene and limonene were metabolized, but not the acyclic β-myrcene. Thus, the degradation of the acyclic β-myrcene required the activity of a linalool dehydratase-isomerase that was not necessary for the degradation of cyclic monoterpenes. This observation indicates for the presence of a second hydrocarbon activating system in C. defragrans. Table 3 described plasmids, C. defragrans strain 65Phen (wild type as well as derivatives) and E. coli strains used in this study. In course of the text, abbreviations are: i) C. defragrans 65Phen-RIF is equivalent to C. defragrans RIF; ii) C. defragrans 65Phen-RIF Δldi is equivalent to C. defragrans Δldi; iii) C. defragrans 65Phen-RIF Δldi comp is equivalent to C. defragrans Δldi comp; iv) C. defragrans 65Phen-RIF ΔgeoA is equivalent to C. defragrans ΔgeoA; v) C. defragrans 65Phen-RIF ΔgeoA compgeoA is equivalent to C. defragrans ΔgeoA comp. a abbreviated in course of the text to C. defragrans RIF, b abbreviated to C. defragrans Δldi, c abbreviated to C. defragrans Δldi comp, d abbreviated to C. defragrans ΔgeoA, e abbreviated to C. defragrans ΔgeoA comp. E. coli strains were cultured according to established methods. For propagation of plasmids, additional antibiotics were supplemented in the indicated concentrations. Maintenance and growth experiments in liquid cultures with C. defragrans 65Phen and mutants were performed as described previously. Growth in liquid cultures was monitored by turbidity measurements at 660 nm. Minimal medium for plates contained 50 mM sodium acetate in medium solidified with 18 g/L agar and additionally buffered with 50 mM HEPES, pH 7.2. Incubation took place in anaerobic jars for 4 to 5 days under N2 atmosphere at 28°C. Biomass production of C. defragrans strains was performed according to. Antibiotics were used at following concentrations (unless indicated otherwise): 50 μg/mL ampicillin, 50 μg/mL kanamycin, and 150 μg/mL rifampicin. 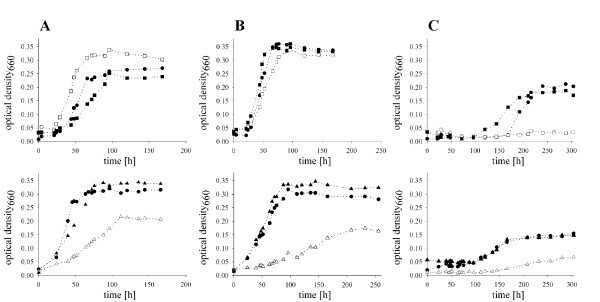 Plating efficiency was determined by plating decading dilution-to-extinction series of cell suspensions with known optical density (OD) at 660 nm in duplicates. Genomic DNA was isolated from C. defragrans 65Phen using the DNeasy Tissue Kit (Quiagen, Hilden, Germany). Plasmid DNA was isolated from E. coli strains and C. defragrans 65Phen using mini-plasmid preparation kits (Quiagen). Gel-excised PCR products and plasmid fragments were purified with the QIAquick gel extraction kit (Quiagen). PCR amplification was usually performed using Taq polymerase (Promega, Madison, USA). For cloning purposes a mixture of Taq polymerase and a thermostable polymerase with proofreading activity (Fermentas, St. Leon Rot, Germany) were applied. Preparation of total RNA from C. defragrans strains after growth on α-pellandrene was performed with RNeasy Mini Kit (Qiagen) according to manufacturer’s instructions, followed by cDNA synthesis using the Revert Aid™ First Strand cDNA Synthesis Kit (Fermentas). For transcriptional analyses, RT-PCR was performed with 35 cycles with primer pairs listed in Table 4. Negative controls included RT-PCR without reverse transcriptase. Table 4 lists primers used for the different amplification purposes. Restriction sites are underlined. Oligonucleotide primers derived from annotated 50 kb contig of C. defragrans 65Phen (Acc. no. FR669447.2). a wild type; b C. defragrans Δldi, c C. defragransΔgeoA. Subcloning of PCR products into pCR4-TOPO® vector (Invitrogen, Darmstadt, Germany) was performed corresponding to manufacturer’s instructions. PCR products with inserted restriction sites and purified plasmids were digested with the appropriate restriction enzymes and separated by gel electrophoresis. Both digested plasmids and PCR products were gel excised and purified. For ligation reactions, an insert-vector ratio of 1:1, 3:1 or 10:1 was chosen. To this mixture, T4-ligase buffer (1x), ATP (25 μM) and T4-ligase (2.5 U) were added. Incubation was for 12–16 h at 12°C. Transformation of 5 or 10 μL of the ligation reaction to chemical competent E. coli strains S17-1 or Top10 was performed as described. Single colonies growing on selective solid medium were picked and screened for the correct insert size by PCR applying M13 or T7 primers. Plasmids of positive tested clones were purified and served as sequencing templates. The 5`- and 3`-flanking regions of ldi or geoA and the start and stop codons of the deleted gene separated by an appropriate specific restriction site were inserted into the suicide vector pK19mobsacB. Oligonucleotide sequences are listed in Table 4. Initially, the flanking regions were amplified from genomic C. defragrans 65Phen DNA with primers adding restriction enzyme sites to the PCR-product. The 5`-flanking region to the ldi was obtained with the primer pair ORF25_EcoR I_F and ORF25_Xho IATG_R. During amplification of the 3`-flanking region with primer pairs ORF27_Xho I_TAA_F and ORF27_Hind III_R difficulties occurred due to a terminator structure in the genome sequence that was solved with a nested PCR approach. A 2.2 kb amplicon comprising ORF 27 was obtained with the primer pair p27plus_F and p27plus_R that served as template for the initial named primer with an increased initial denaturation time (from 4 min to 10 min). Sequencing of the 763 bp amplicon revealed a base exchange at position 373 from guanine to adenine causing an amino acid replacement from proline to threonine. This shift was revoked by a site directed mutagenesis approach using primer p27_mismatch_F and p27_mismatch_R in combination with ORF27_Xho I_TAA_F and ORF27_Hind III_R, respectively. The particular amplicons were bond to each other in another reaction with the exterior primer pair. The 5`-flanking region of the geoA was obtained with the primer pair ORF2930_Xba I_F & ORF2930_Xho I_R and the geoA 3`-flanking region ORF32_Xho I_F & ORF32_Hind III_R. The obtained products were subcloned into pCR4-TOPO (Invitrogen, Darmstadt, Germany) and yielded pCR4-ORF25, pCR4-ORF27, pCR4-ORF2930 and pCR4-ORF32. The sequence correctness of these constructs was confirmed by sequencing and restriction digests. Subcloning vectors were double digested with the prevailing added recognitions site for restriction enzymes. The flanking regions were excised, purified and ligated via a three-piece-ligation into the suicide vector pK19mobsacB. Sequencing of the obtained plasmids pK19mobsacBΔldi and pK19mobsacBΔgeoA was performed to ensure correct sequence of the flanking regions including the start and stop codons of the deleted genes. For construction of the in trans vector both, the ldi and the geoA was amplified from genomic DNA of C. defragrans 65Phen with primer pair encompassing the entired ORF, i.e. for the ldi primer pair ldi _EcoR I & ldi _Bgl II, and for geoA geoA _Xba I_F & geoA _Hind III_R (Table 4). Via the added restriction enzyme recognition sites the amplicon was inserted into the multiple cloning site of two different derivatives of the broad-host range vector pBBR1MCS. For confirmation of correct gene insertion the obtained plasmids pBBR1MCS-4ldi and pBBR1MCS-2geoA was sequenced. The donor strain, an overnight culture of E. coli S17-1 carrying the appropriate plasmid, and the recipient C. defragrans RIF were grown to late exponential phase and were mixed in several ratios (1:1, 1:5, 1:10) in a total volume of 20 μL and spread as a single drop on minimal agar. After incubation for 24 h at 28°C under oxic conditions the bacteria were resuspended in 1 mL liquid minimal medium. Dilution-to-extinction series were streaked out onto solid minimal medium supplemented with kanamycin and rifampicin and anaerobically incubated at 28°C for four days. Soluble extract preparations of C. defragrans strains 65Phen, ΔgeoA and ΔgeoA comp were performed as described. The geraniol dehydrogenase activity was monitored in a standard assay following the reduction of NAD+ to NADH at 340 nm as described. Equal total protein amounts were applied as certified in a 200-μl aliquot by the method of Bradford with BSA as standard protein; concentrations were corrected for the unusual high binding of the Coomassie stain to albumin. Nitrate and nitrite was measured by HPLC as described by. Based on the fact that protein accounts for 50% of the cell mass, the Bradford assay was applied in duplicates with two different dilutions to determine the total biomass yield. Geranic acid formation was assayed in liquid cultures of C. defragrans strains after confirmed nitrate depletion (Merckoquant® test strips (Merck, Darmstadt, Germany)). 10 mL cell culture was acidified with H3PO4 (final concentration 0.1 M) and extracted with tert-butyl methyl ether in a 1:0.4 ratio (two biological replicates per strain). The ether extract was extracted with 0.1 M NaOH (1:1) and the aqueous phase was subjected twice to reverse-phase HPLC on a Nucleodur® C18 ISIS (4.6 mm × 250 mm, Macherey Nagel, Düren, Germany). Separation of the organic acid was performed with 1 mM H3PO4 in an isocratic water-acetonitrile eluent (45/55 (v/v)) at 1 mL/min and 25°C. Intermediary, the column was cleaned with water-acetonitrile (20/80 (v/v)). UV detection was performed at 215 nm. We thank Robert Marmulla and Maria Grünberg for their technical assistance in the construction of C. defragrans Δldi. This study was financed by the Max Planck Society. AD isolated the rifampicin resistant C. defragrans strains and assayed the conjugation frequencies. AD constructed pK19mobsacBΔgeoA and obtained C. defragrans ΔgeoA. FL obtained C. defragrans ΔgeoA and Δldi deletion mutants and constructed the pBBR1MCS-2 derivates. FL performed all the physiological experiments. FL and JH analysed the physiological experiments and wrote the manuscript. All authors read and approved the final manuscript.